I heard about this unlikely looking place from “Diners Drive-ins and Dives.” It is well known for Fried Chicken and Waffles - not two dishes but on one plate. What else is neat is that this former fast food place, that still has lots of leftovers like the floor and the seats and the tight parking lot, does a lot of things really well. 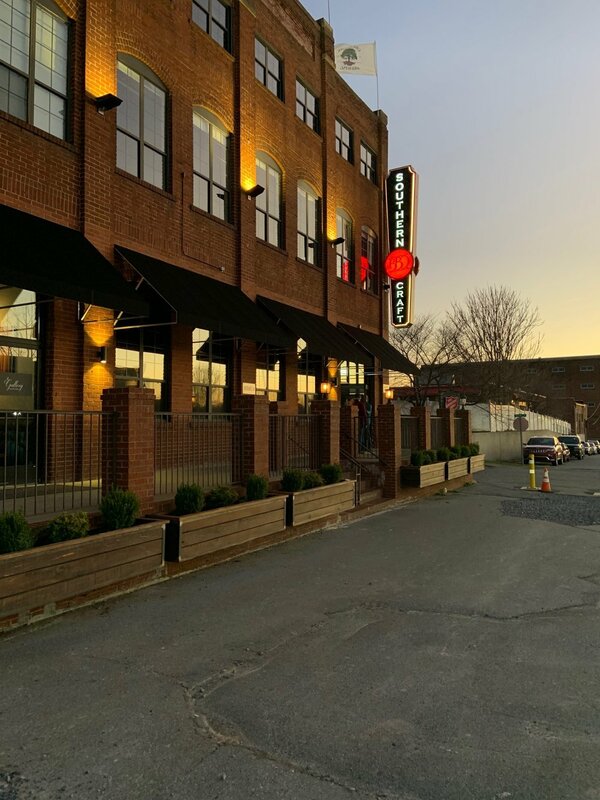 We have eaten here four times and every time the food was presented nicely and prepared with excellence. This last trip including our friends Janet and Rusty and all four of us, again, had a good meal, very reasonably priced. They have a lot of homemade desserts and they make there own ice cream. I have had root beer ice cream here and it was good but the very limited menu -five flavors - were all a bit too off the grid for me this time. 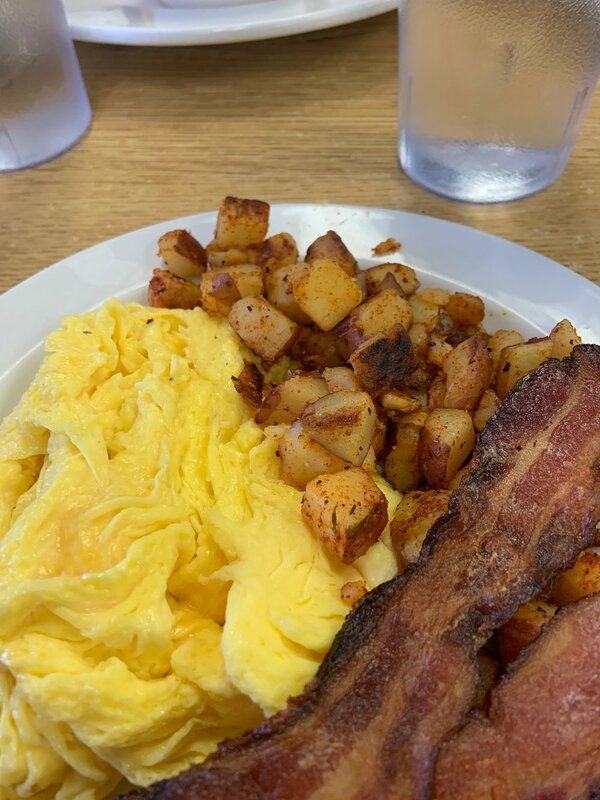 So leaving Charleston on Rt 17 south you will drive right past the Early Bird and we highly recommend a stop for breakfast, lunch or dinner. We have not reviewed an ice cream shop for way too long but I was skeptical because the name is spelled wrong to emphasize the ICE portion and second - they appeared to be trying to do too much. Gelato, ices, ice cream and lots more. Often this effort suffers because it is not focused on a specific product and making that “What We Do” great. I was wrong. Shocking right? I had a great scoop of Key Lime Pie on day one and a Salted Caramel with swirls on day two. Yes, day two, you do have to check for consistency, after all. Cindy had mocha almond fudge. The young ladies working there were engaging and lots of fun. We would highly rate the Paradice as a go to for your ice cream needs on the SC beach. No matter which beach you choose, the drive is worth it. These were the reasonable gourmet cones! So let’s just get this out of the way cause if I don’t I will never hear the end of it. Rusty found this restaurant. We ate in the Park Circle area of North Charleston the new trendy area (I know, how did Rusty….). It is a small cinder block building on the back street with the kitchen located behind the building in a food truck. 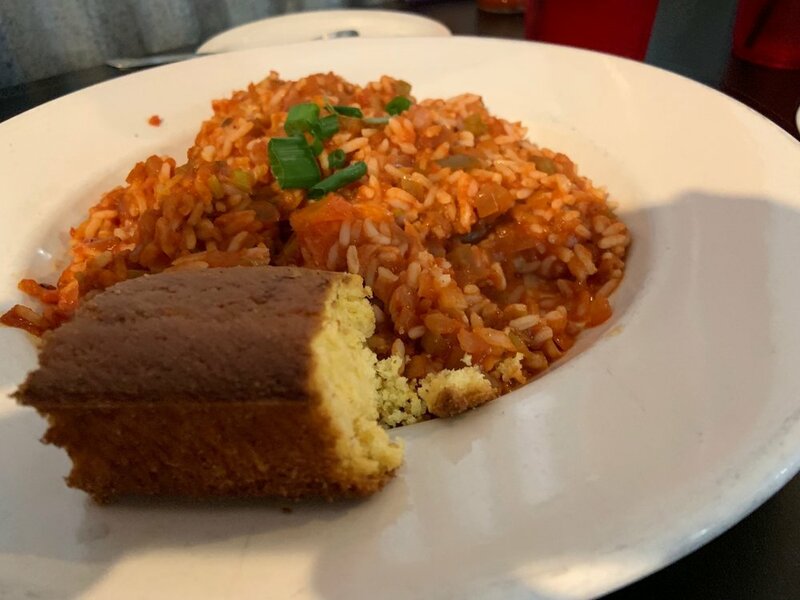 loLA combines the low country style of cooking with a New Orleans twist. It was excellent. I had a great fish n chips that had a hint of heat in the batter, CJH had a shrimp creole that was really good. ( I had half of it for dinner on day the next day.) Rusty had something and Janet had something else likely with shrimp - the details are why you like this blog! So great food, reasonable price, happy servers and lots of people. Can’t miss at loLA. Credit to Rusty for this find. So, I don’t eat pizza, something to do with the cheese they bury perfectly delightful bread under - but I still had a good meal here and the rest of the party were delighted with the pizza. So it is likely pretty good. Via Napoli is, of course, in the Italy section of Epcot along the World Showcase and replaced an older Italian version that we did not like very well. This one is fun, good food, nice environment and not too expensive. Epcot is an eaters delight. I have eaten in Mexico, Morroca, Canada, England, Germany, Norway, Japan and France. 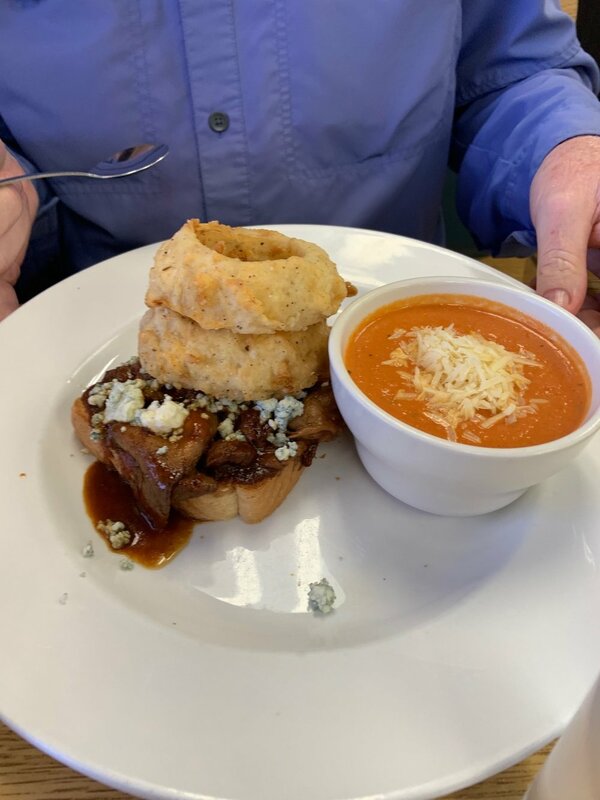 Amazing meals in Canada - I am a bit miffed at them because they removed from the menu the Best Hamburger I Ever Ate - but it is still an exceptional place. Loved our meal in France, both times - plus the pastry places in France and Norway are so good. Well this is not supposed to be about Epcot just hard to focus on a single place. Oh, and I think Rusty was here too. Hard not to like a place that features ovens like this! I really don’t recall much about this restaurant. I do remember that I liked my food, but not what I ordered. Cindy really liked her meal, not sure what that was either. I do know it was not far from where we were staying and that I did not pick the place. Rusty did. I don’t like to give him too much credit but he did order the dessert as well and THAT I remember. 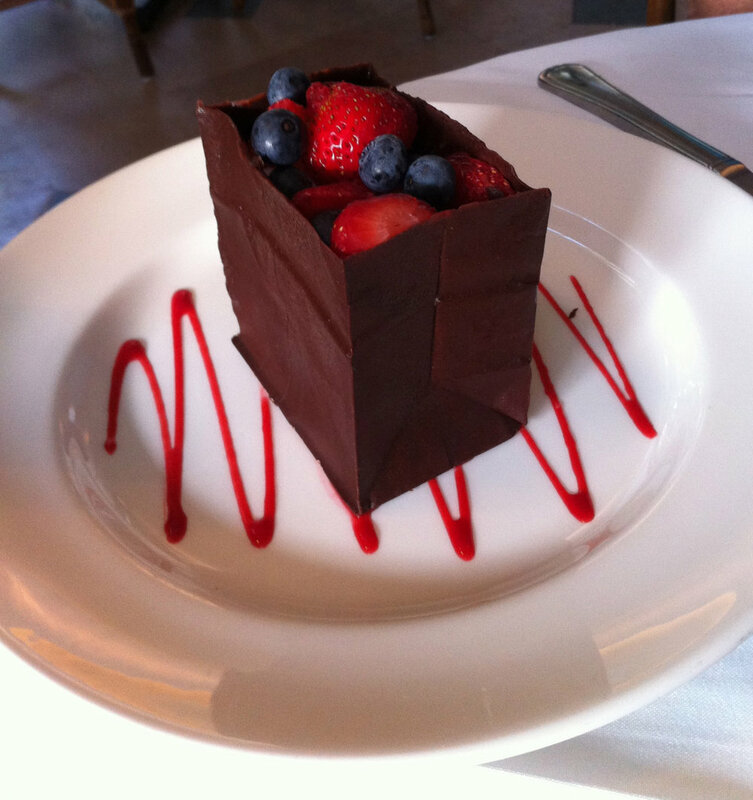 A “paper” bag full of fruit, but the bag was made of chocolate. So cool. OK, so he gets some credit. I am a fan of Cracker Barrel, especially when we are traveling and need a decent meal and a fair price. Nothing is great, well maybe the blueberry pancakes qualify, but it is good food usually done well. Imagine the CB with a 700HP big block Ford, supercharged. Welcome to Five Oaks Farm Kitchen. 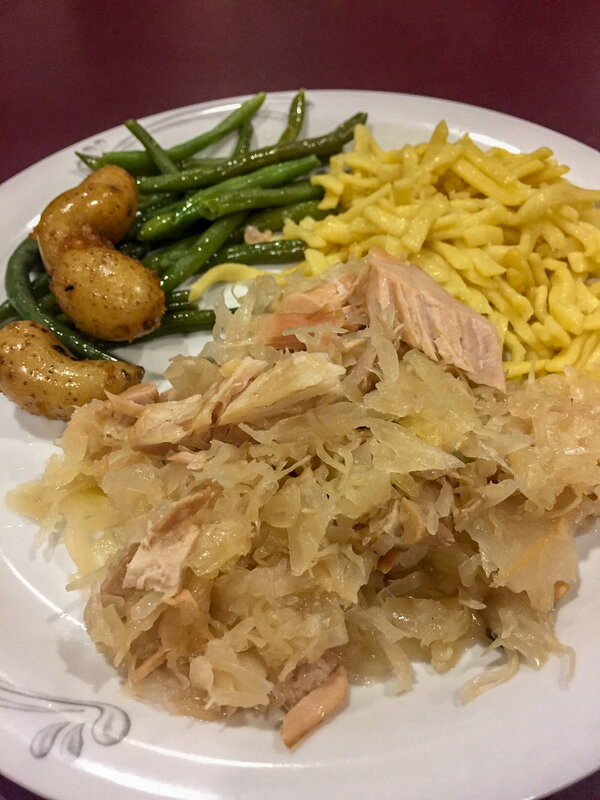 Cindy and I were at Johnson University homecoming and our dinner plans feel through for various reasons and we were not eating in the cafeteria again. So we headed off campus toward Sevierville with nothing in mind. We passed a couple of “maybes” and were just on the road to Pigeon Forge when I spotted this place. Super find. They start by bringing you a cup of potato soup, doesn’t matter what you order. It is a light broth and full of potatoes. And they bring you biscuits. Sound familiar? Forget it, these are huge, really good and served with honey from their own bees. I did not need to order because, biscuits, but I did. Fried Chicken that was, well here is their description: “fresh chicken soaked in whole buttermilk and Tennessee hot sauce then dredged in seasoned flour and Ritz cracker crumbs. Fried in peanut oil. Served with coleslaw and corn on the cob.” Excellent and they gave me two breasts instead of the leg/thigh. Accommodating. Cindy ordered several sides and ate one of the chicken breasts. We wanted Cherry Cobbler but they were out. Guess we are forced to go back. It was not CB prices - but it was definitely not CB food. We both completely enjoyed both the food and the experience. Oh, and the history of the location makes it even better. They have generous portions, a diverse menu, smoked meats, and are open for supper, lunch and breakfast. I just can’t wait to try breakfast. Go! This is one you have to trust the other people with me cause I don’t eat pizza. However they, Cindy, Rusty and Janet, LOVED this typical New York thin - fold the crust - pizza. Somewhere in Greenwich Village. 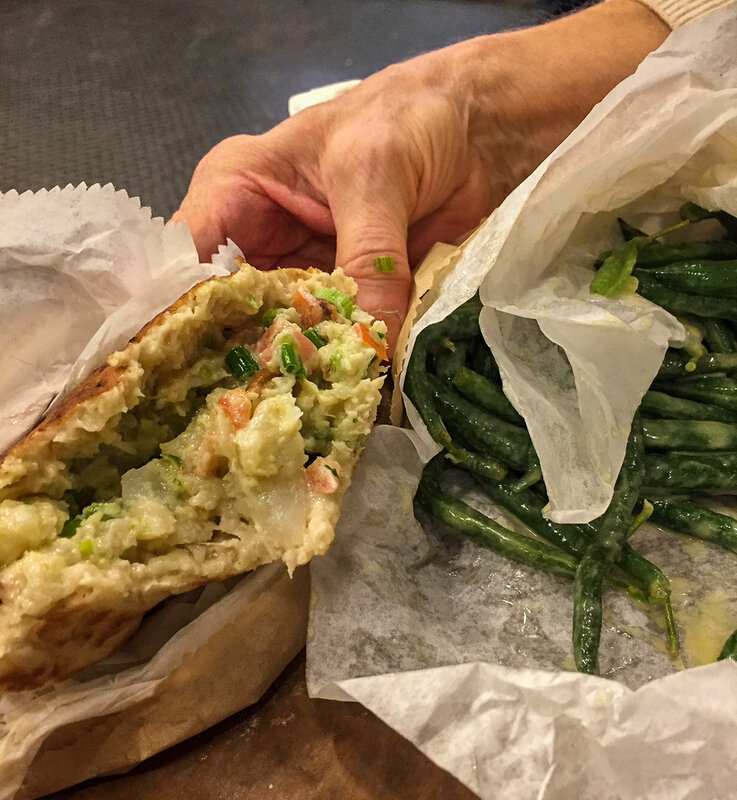 Joe’s is a NYC institution and loved by those who fancy a slice. This was a very nice surprise in Johnson City, a pleasant upscale BBQ place with very good side dishes. And, drum roll, BURNT ENDS! My favorite. I had those the first time in Kansas City and not too often since but they were here and they were good. Cindy had sweet potato souffle, tomato -cucumber salad and fried green tomatoes and ate some of my plate. We had plenty. Six different sauces including a very spicy mustard based one were great with the meat. Nice atmosphere in a old repurposed building with “State of Franklin” featured and homemade ice cream which I cannot really describe very well. The coffee ice cream tasted more like a frozen mousse - good, strong flavor but unusual texture. Still excellent meal. We were in need of coffee and found this little spot a block or two off of the main street while walking around the town of Watkins Glen. We love this kind of spot and prefer it to the more corporate experiences that abound. Seneca was the best of these kinds of places: they roast their own coffee, they care about the quality of the coffee using only Fair Trade organic arabica beans and they roast in small batches like our favorite, Rostov’s in Richmond. The shop was small with a nice front porch. They were busy but patient and they had some unusual things such as Cascara, a brewable coffee blossom - which we have yet to try and a Rhubarb Shrub that is delicious. We also came home with a pound of one of their single origin coffees. If you are in Watkins Glen, stop here - if you are in some other town or city look up the small owner-brewer shop and you will enjoy your coffee and your experience better. Sometimes places are famous for things and everything else pales in comparison. Not so at Juniors, famous for their cheesecake yet the food is fabulous. 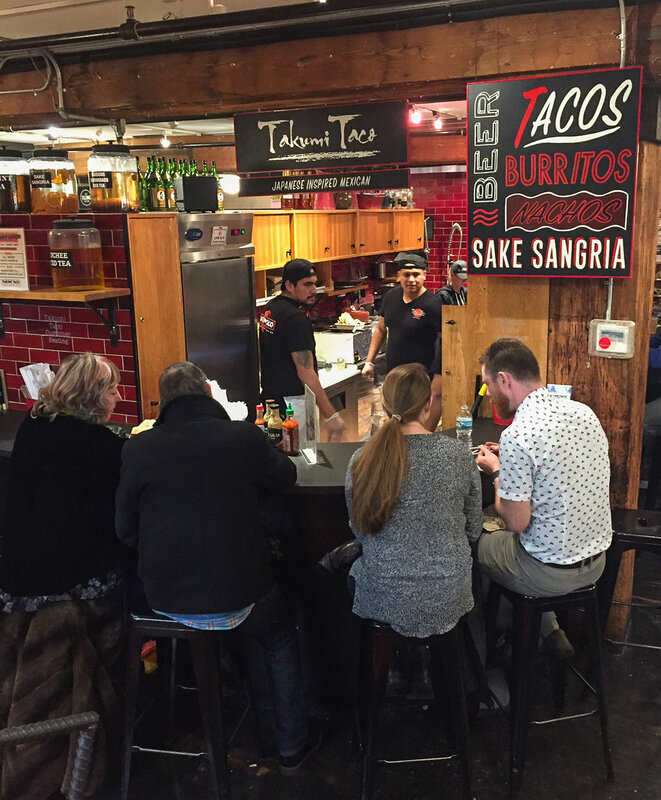 It is a hectic, crowded, noisy place with servers bustling down every aisle. That’s OK, the food is fabulous. There is likely a long wait to be seated and nearly no where to wait in the tiny alcove by the door. That’s OK, the food is fabulous. I love that they bring pickles to your table, and cole slaw - no matter what you order! CJH had a tuna dish that was nearly as big as she was. I had a much more modest sandwich and fries that actually fit on the plate, or a tiny bit over the edge. 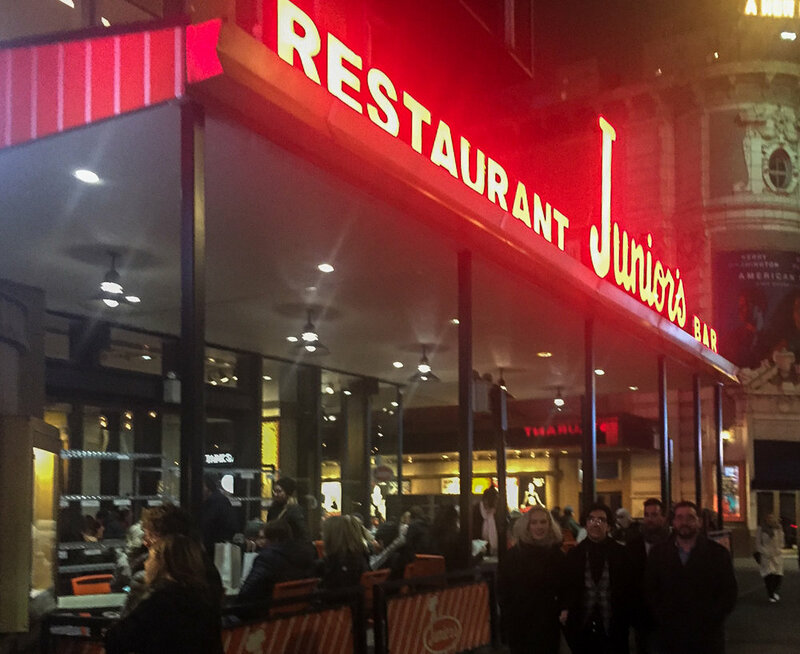 Juniors is the archetype of a New York sandwich shop, boisterous, loud, expensive and you don’t really care because the food is fabulous. Pickled beets, cole slaw and pickled pickles, love it. The other aspect of the history is that this place started in 1892! The first espresso cafe in US. Amazing shop with constantly fresh pastry and lots more. But, truth is I have only eaten the pastry. I read about Ample Hills in almost every article about great ice cream in NYC but it was in the Bronx and I have never been to the Bronx. 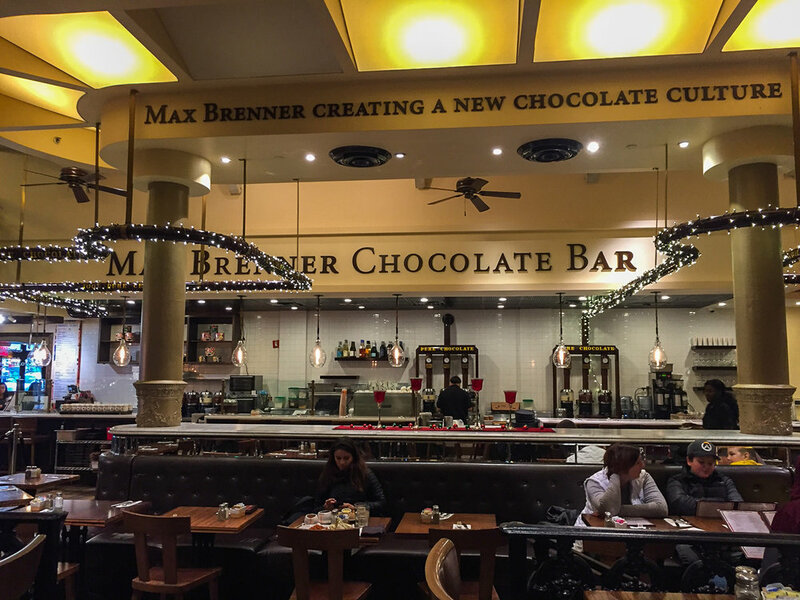 We never cover everything we want to see and do in Manhattan so the Bronx and the Ample Hills Creamery was unvisited and untried. Until our last trip to NYC. We went to the Chelsea Market for lunch and after, as is my habit, I looked on the iPhone Maps for “ice cream nearby” and Ample Hills was one block away. No New Yorker late for a subway ever covered a block quicker. They had opened here recently and I was delighted. The ice cream more than lived up to the promise. In fact, this is now included in my “Top Five” in the country as I mentioned a few posts ago under the Island Creamery. 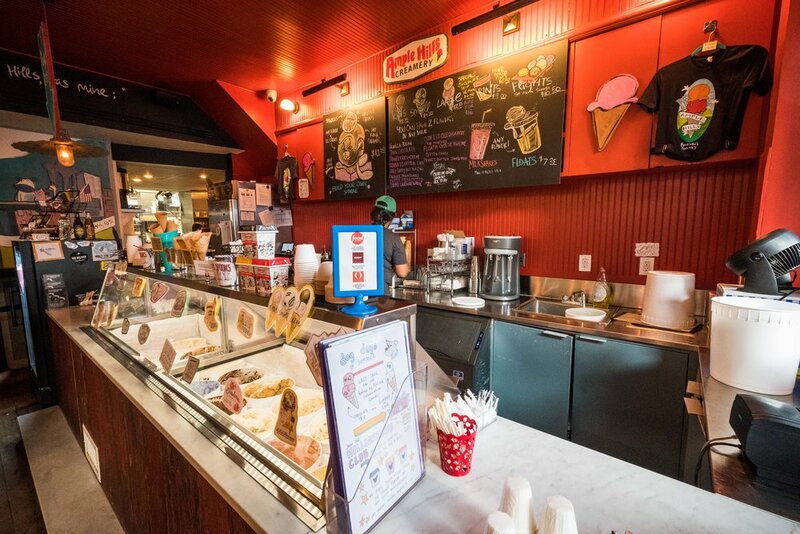 It is a small space attached to a bar with only a couple of tables and a separate entrance dedicated to the ice cream. 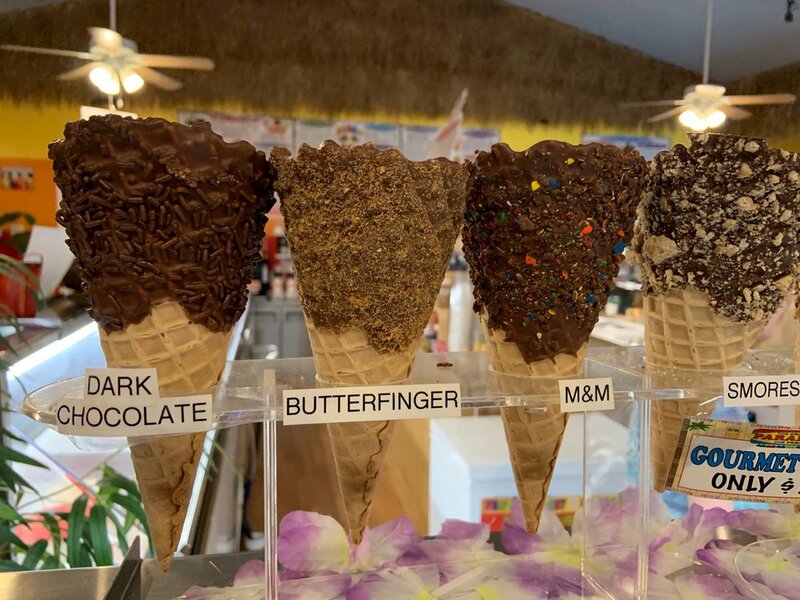 They get extra stars because you can get two flavors in ANY size cone or cup, big plus, they bake and make all their add-ins in house (plus plus) and they developed special flavors for Disney’s Mickey’s 90 Birthday. You can get them in the store or at the recently opened kiosk at Disney’s Boardwalk. Finally a reason to go to Disney that I like! Cindy and I had four flavors in two small cones including an oatmeal, butterscotch, chocolate and a speciality flavor a root beer, that is available only in this store (actually each of their now 12 shops have one unique flavor). Seriously great ice cream. Whew. I really need to get to the Boardwalk- if I skip the ticket to Disney that translates into 20 cones. Certainly NOT the RIGHT way. Is there a better sign anywhere, Coffee, Ice Cream and WIFI, I would be 500 lbs if it were down the street. Chocolate pouring and caramel too. From dessert to infinity and beyond.